Vitamin D comes from sunshine, it's one of the most important aspects of solar energy. Here's some very interesting solar facts and advice. What if there were a drug that dramatically reduced the risk of heart disease, cancer, and diabetes … and even helped reverse the effects of aging? A drug that prevented 17 different types of deadly internal cancers, and helped reduce overall cancer risk by 77%. It would be front-page news. You’d be hearing about it every day.Well, there is such a thing, but it’s not a drug. It's produced by your skin when you are out in the sun. It also owers the risk of Type-1 and Type 2 diabetes, and helps prevent auto-immune disorders like M.S. and rheumatoid arthritis. In fact, there are so many benefits, I decided to list them on separate section of this web site (see the bottom of this page for the appropriate links). This “non-drug” has no side effects, and you can get it absolutely free. And, the more you get of it, the better you feel. I’m talking about Vitamin D.
It’s the only vitamin you can get from sunshine. The only vitamin that is also a hormone. In fact, some people called it the master hormone, because it is important in the health of every cell in your body. And it’s the vitamin we, here in the Western World, are most deficient of. In study after study – between 70% to 87% of the adult population is deficient in Vitamin D – and we're not even talking optimal levels – which help you operate at peak performance – just minimum levels. Have you ever noticed how much better you feel after walking in the sun? It can brighten your spirits, give you a great tan, and may just save your life. Most doctors don’t realize the sun can prevent disease. They want you to avoid sunshine at all costs. But, following their advice actually puts you at a higher risk level for heart disease and cancer. For years, most doctors failed to make the connection between prostate cancer and sunlight. But, back in 1990, Professor Gary Schwartz, Ph.D of Wake Forest University, connected the dots. He discovered that people with too little Vitamin D were the ones most likely to get prostate cancer. And these people lived primarily in the north! He found that men living in the south, where there was plenty of sun year round, were 20-40 percent less likely to get prostate cancer than men living in the north. Some researchers estimate that 80% or more of us are Vitamin D deficient. Part of the reason for this is that we've been taught to fear the sun, and to use harmful chemicals to prevent our bodies from producing beneficial vitamin D from our skin. Protecting us from the sun (and good health) is a $35 billion industry, as the video below details. We used to get all the sun we wanted. Our ancestors lived in the sun for millions of years. They lived outdoors every moment of their lives. They were naked, near the equator, in tropical environments, and they didn’t use sunscreen.But around the turn of the century, things changed. It started with the invention of the light bulb, which gave us an artificial way to generate light. The industrial revolution soon followed, and people started migrating north, moving into the cities and working indoors. This boosted living standards for many, but this migration indoors altered our native relationship with the sun forever. And, while the world around us may have changed, your genetic makeup hasn’t. You still need sunlight and Vitamin D to stay healthy and prevent disease. Vitamin D may be the single most important nutrient in your body. And we can all get plenty of it free just by spending some time in the sun. But you want to be sure that you get safe sun exposure. I started working on this web site with a focus on collecting and publishing information about producing electricity from the sun – as electricity is the lifeblood of modern society today. With solar energy – we use solar cells to convert visible light into electricity. Our skin plays this role for our bodies, converting UVB radiation into vitamin D. Like solar cells – the efficiency of our skin in producing vitamin D diminishes with age. Just like with solar energy – the amount of insolation (i.e., electromagnetic energy that reaches a particular spot on the earth), determines how much electricity a solar panel will produce … and how much vitamin D your body will produce. However, unlike a solar cell that can produce even small amounts of electricity with very small amounts of light … our bodies appear to need a certain threshold of UVB radiation to produce vitamin D. This means there could be some months (the farther north you live the more months) where there won't be enough sunlight to produce the vitamin D you need. Also, like electricity produced from a solar cell first has to pass through an inverter to convert the DC into usable AC and then the electricity is made available either to the grid, or the wiring in our houses. In the case of our bodies, the vitamin D3 produced by our skin travels in our blood first to our liver and then to our kidneys where it is converted into the form needed by our cells. Finally, just as its possible to store electricity in a battery, iit's possible to store vitamin D in your fat cells - but also like a battery, the levels can drop quickly when your only operating on battery power. I could go on … but the important point is that by learning about how solar energy is produced, it will also help you understand something valuable about your body … and in both cases, it all starts with the energy produced by the sun. Vitamin D is important for good health and long-life. Here is an interesting video and more articles we've added to our website to give you a full picture of this important subject. Like other parts of this website these articles summarize the important facts and include useful advice. 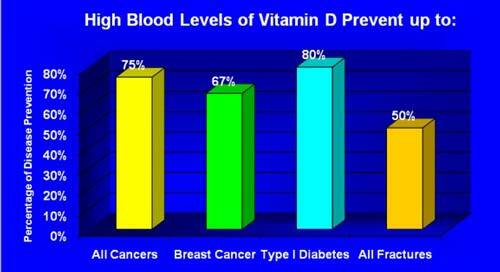 Vitamin D and Flu Prevention / Reduction.